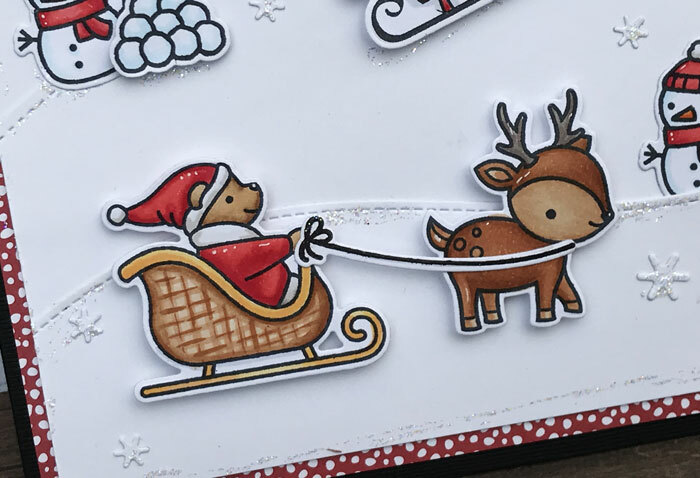 In December I created this ATC for a Christmas swap. I wanted a scalloped frame for my cards and Lawn fawn Stiched Scalloped Rectangles Frames almost fits the size. I just needed a little bit of black background. 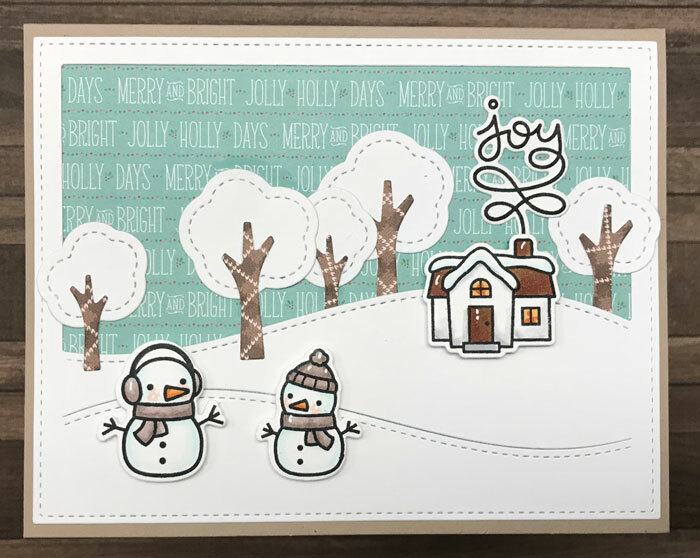 The Joy sentiment is from Winter Village set. 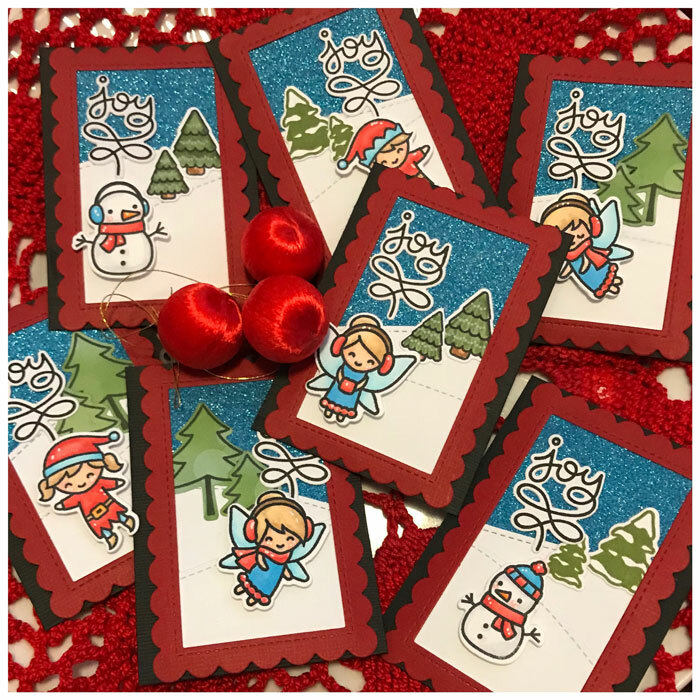 The Snowmen are from Ready Set Snow set and the cute Fairys from Frosty Fairy Friends. 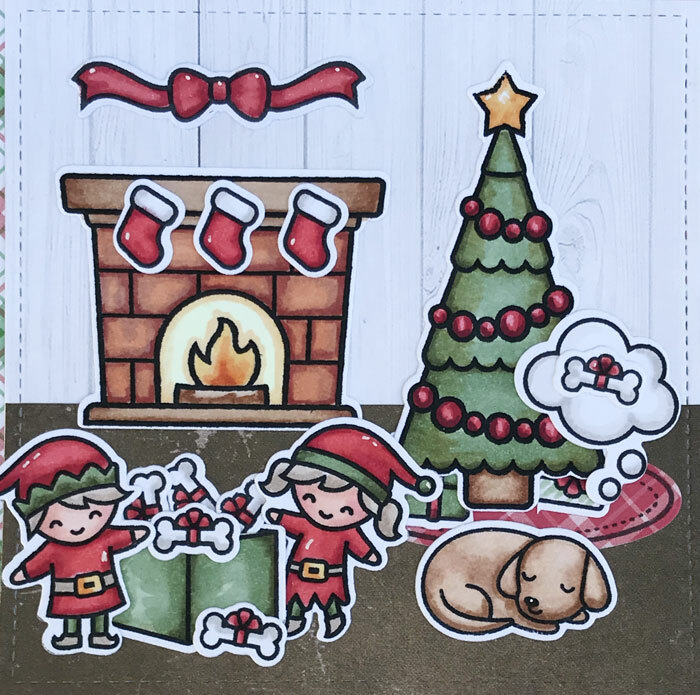 I also wanted to use one of my newer sets called Holiday Helpers Set. I tried different trees and some of them are from the Happy Trails Set. To get the snowy background I used Stitched Hillside Borders. The blue sparkling paper is from The Flying Tiger. All images are colored with my Copics. 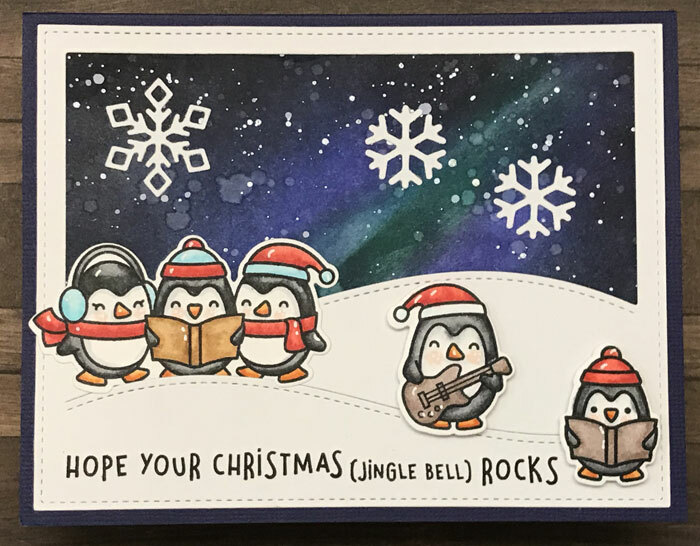 This will be my last blog post with all my Christmas cards sendt for family and friends 2018. My first two are almost the same. But I don´t like to do the same cards so I always make them a little bit different. 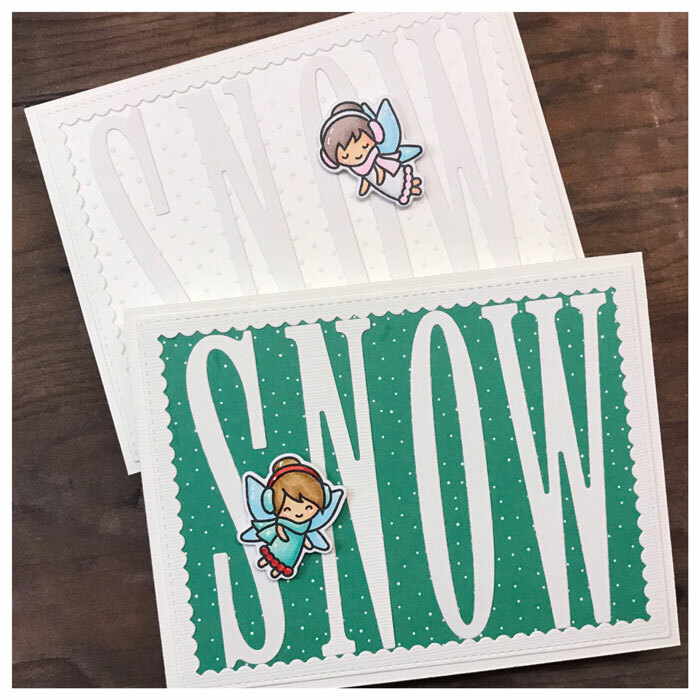 The teal one is a paper from Lawn Fawn Snowday. I used an old Quick Cut alphabet called Abigail. The frame is die from MFT Die-Namics called Stitched Rectangle Scallop FRame. 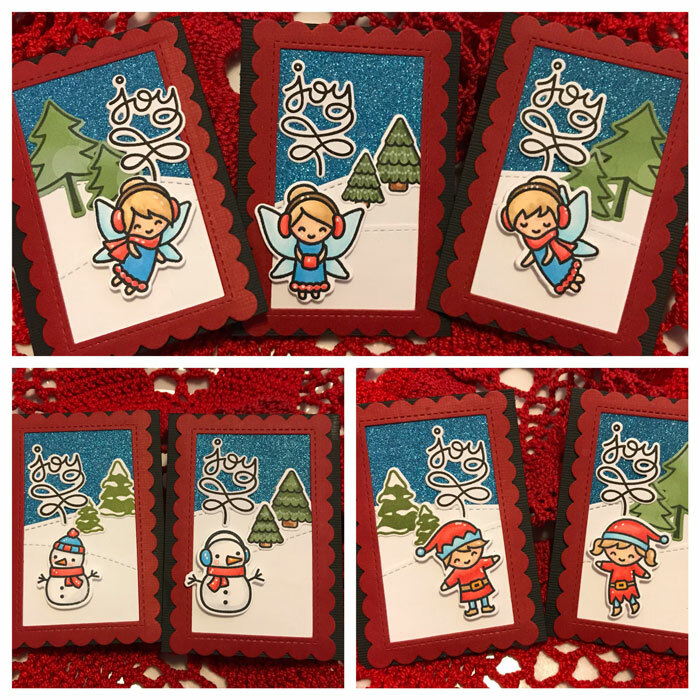 And the cute fairy is from the Lawn Fawn Frosty Fairy set. 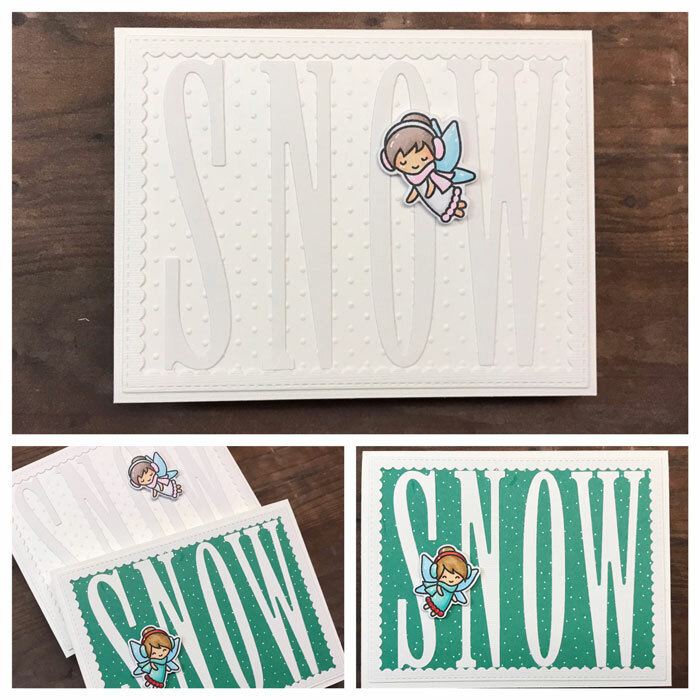 For the white card I used the same supplies except that I used a Embossing Folder from Cuttlebug called Swiss Dots. They turned out supercute! My next card was made for a sweet friend that loves mice. 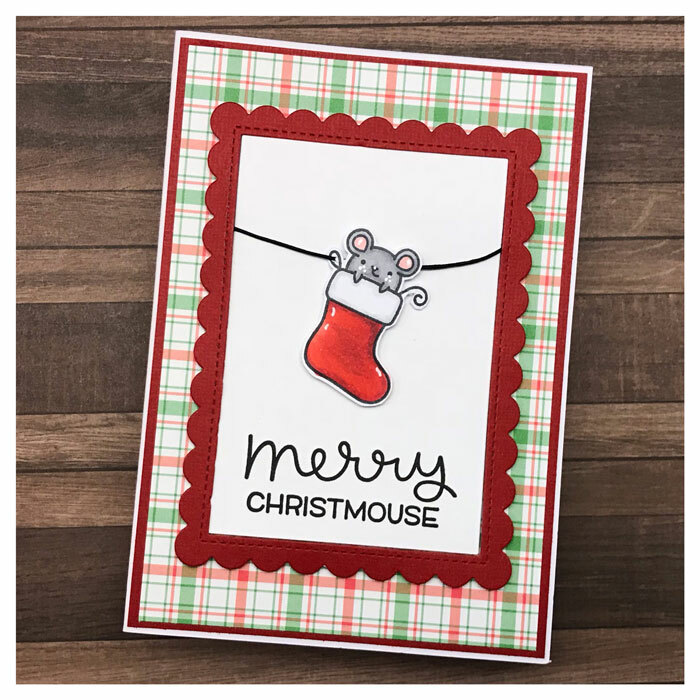 I used Lawn Fawn Scalloped Rectangles Frames and the very cute mouse from Lawn Fawn/Simon Says Stamp Merry Christmas stamp set. I fussy cutted the mouse and used a wire thread from Prima. 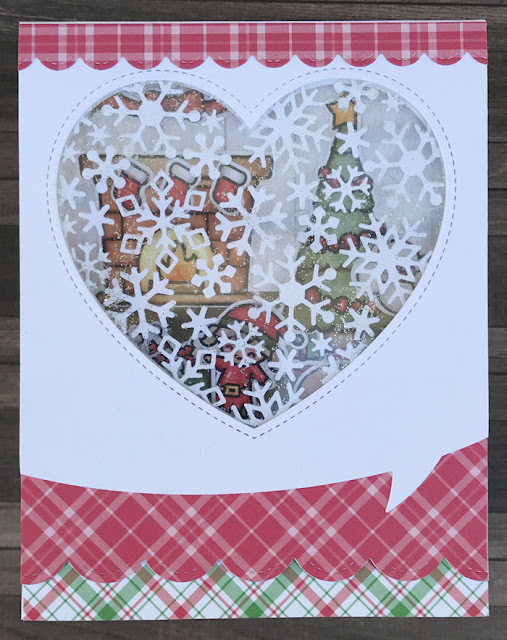 Patterned paper from Lawn Fawn called Perfectlyplaid Christmas 6x6. For this card I used patterned paper from Papirdesign and Lawn Fawn. I used Stitched Square Frames from Die-Namics. I created the background with Lawn Fawn Simple Stitched Hillside Borders and Simple Road Border. car and trees are from the set called Home For The Holidays. Last I added Santas Sleigh from the Ready Set Snow set. 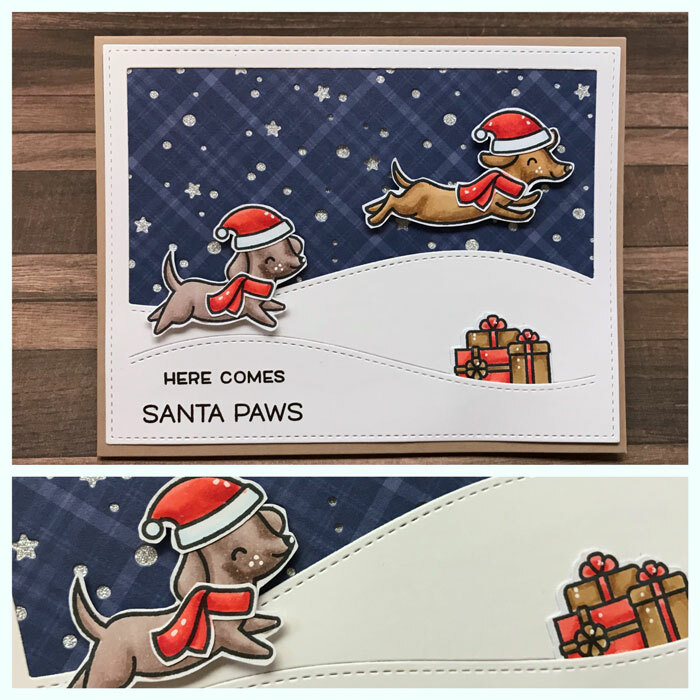 And my last card was made for a dog lover! 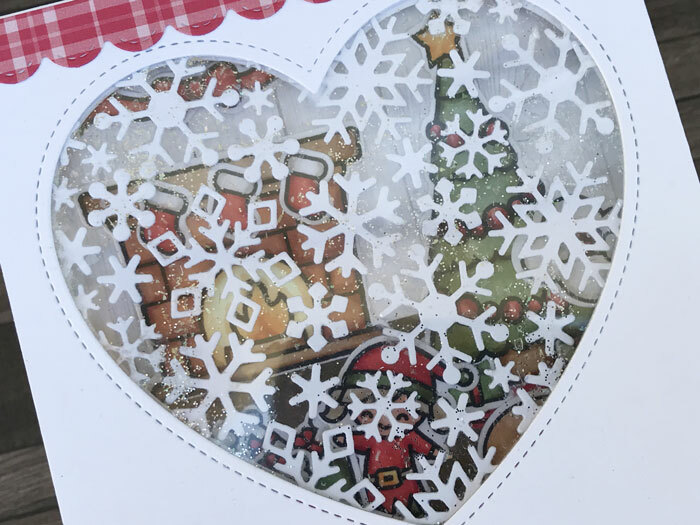 Here I used the backdrop die again from Lawn Fawn. 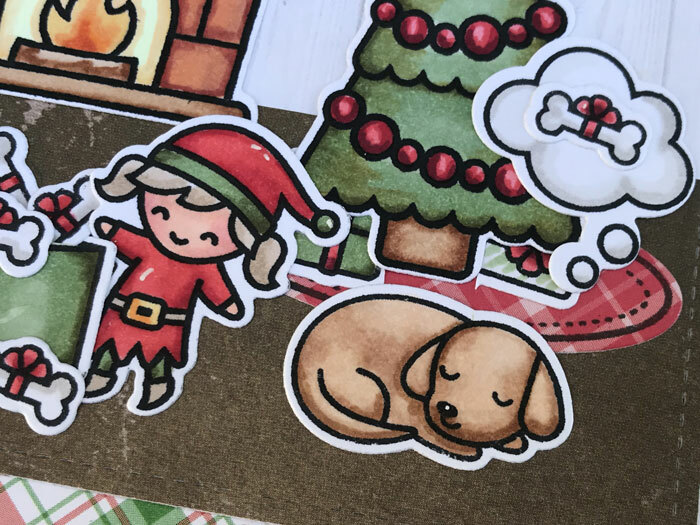 The puppies are from Lawn Fawn Exclusive Friends Forever and Critters At The Dog Park Set. I fussy cutted the scarves and hats. I created the sparkly background by layering a sparkly paper from Flying Tiger with the dark blue from Lawn Fawn. 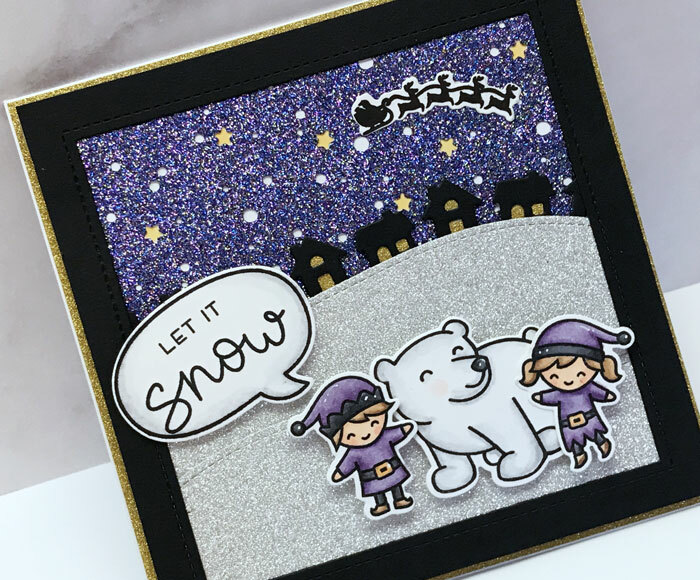 But first I used the Snowy Backdrop die. 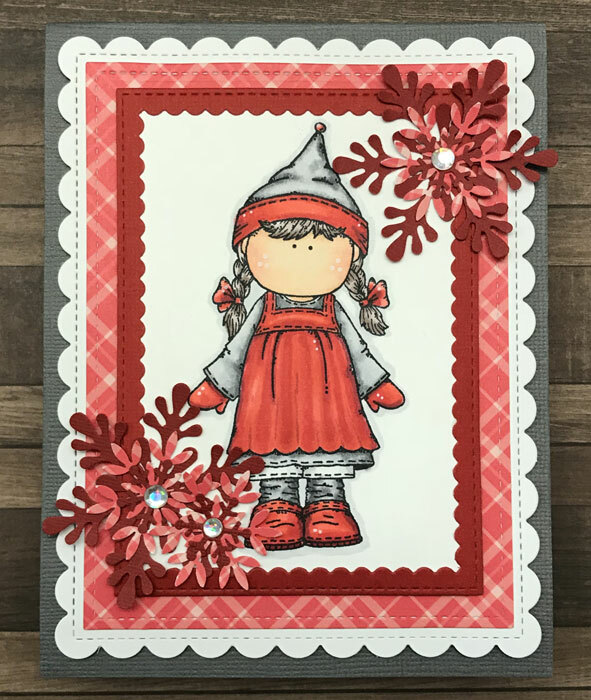 Thank you for visting my blog and I hope you feel ispired to start early with your 2019 Christmas cards! 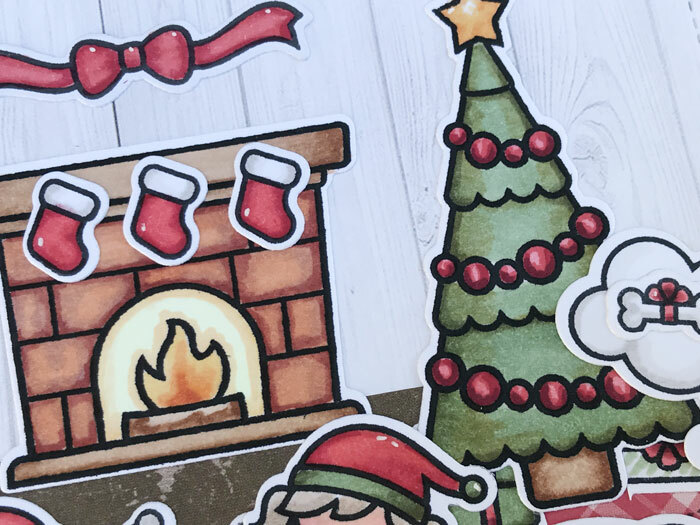 Tomorrow I will show you some ATC in a cosy Christmas style. Today I have two cards with a fun effect. The first one is a shaker card. 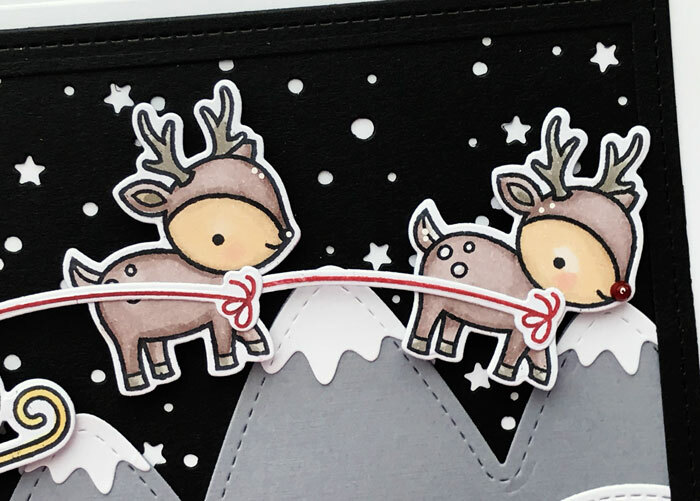 I´m totally in love with this Reindeer from Lawn Fawn Critters in the snow set! Look at that swag! To create my shaker card I used Lawn Fawn Reversed Stitched Scalloped Circle Window Die. I like to use OH plastic sheets for my shaker cards, I also use Foam Sheets to get an even surface. I always use the EK Success powder on both patterned paper and the OH sheet. Last I added the Scripty Merry die and used a really sparkly paper from Flying Tiger. When you open this card you have the same paper from Lawn Fawn Snowdays on both sides. On the right you have cute bunnies playing in the snow. The window is all see thtow from both sides. For the front I used a patterned paper from Snowday 6x6. 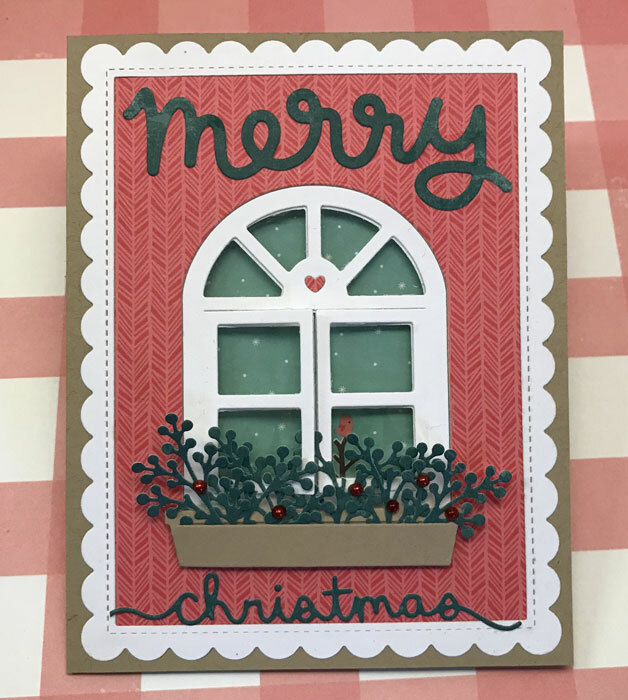 I used Lawn Fawn Scalloped Rectangles Frames, Wonderful Window (wth OH between), Scripty Merry and Merry Christmas Border. The green tvigs are made witha die from Creative Expressions called Berry Bough. Red pearls from Papirdesign. 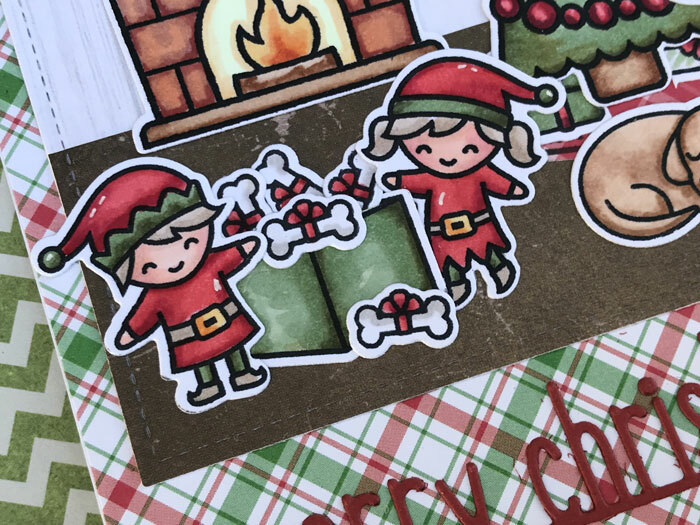 I still have some Christmas Cards left to show you tomorrow! Hello! Today I´m back with some cards with houses on. 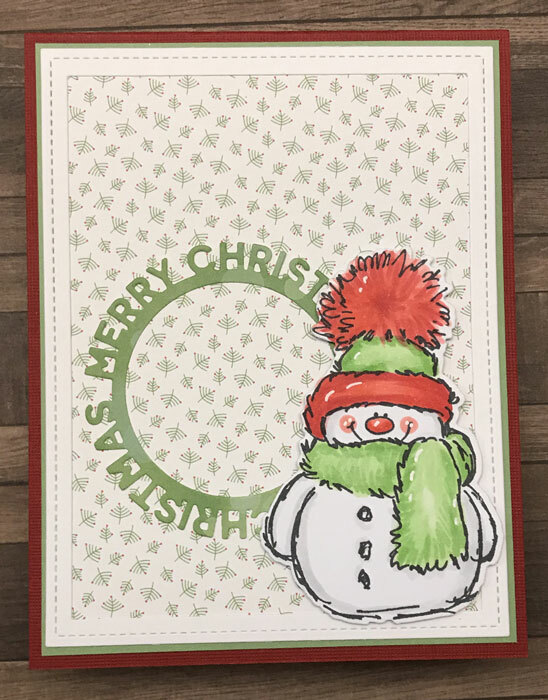 For this first one I used Snowmen from Ready Set Snow set. The house is from Winter Village set. I used Stitched Hillside Backdrop Landscape for the scene. Patterned papers from Lawn Fawn Snowday 6x6 and Knit Picky Fall 6x6. 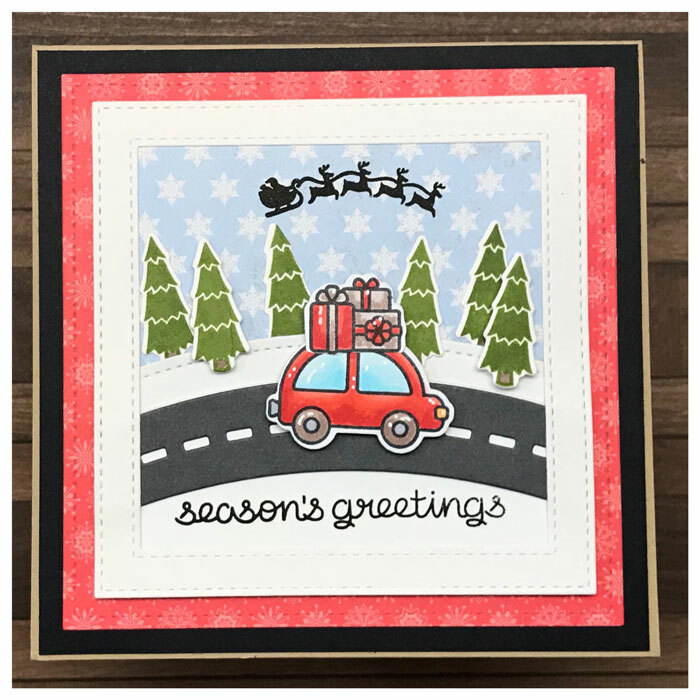 For my second card today I used the same Backdrop die. I used houses and trees from Winter Village set. 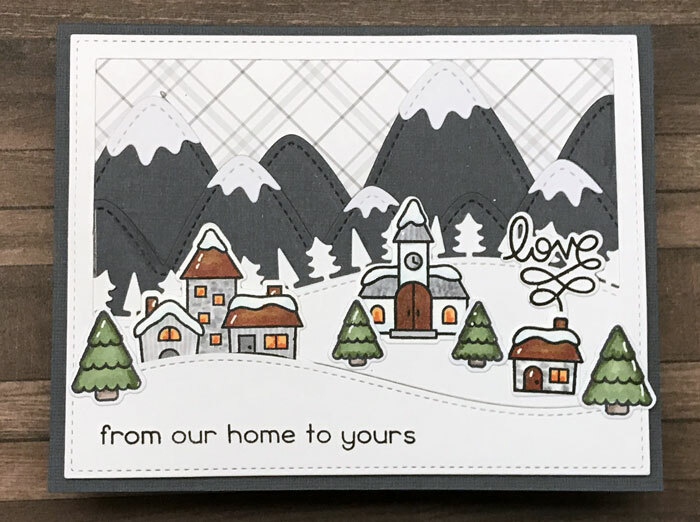 I also used Stitched Mountain and the patterned paper is from Perfectlyplaid Winter 6x6. Welcome back tomorrow for some 3d and fun effect cards. 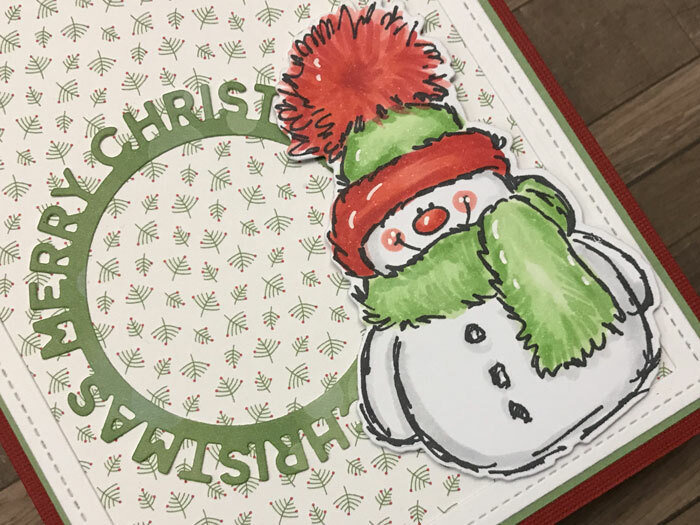 Time for next post with my Christmas Cards 2018. 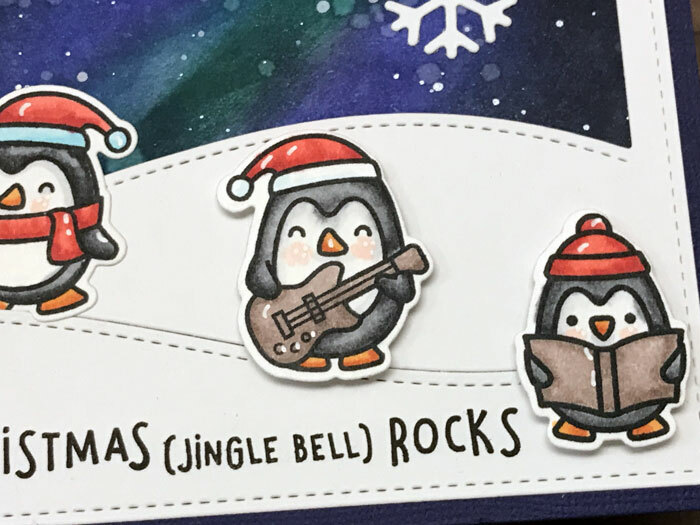 Today it´s all about Penguins! 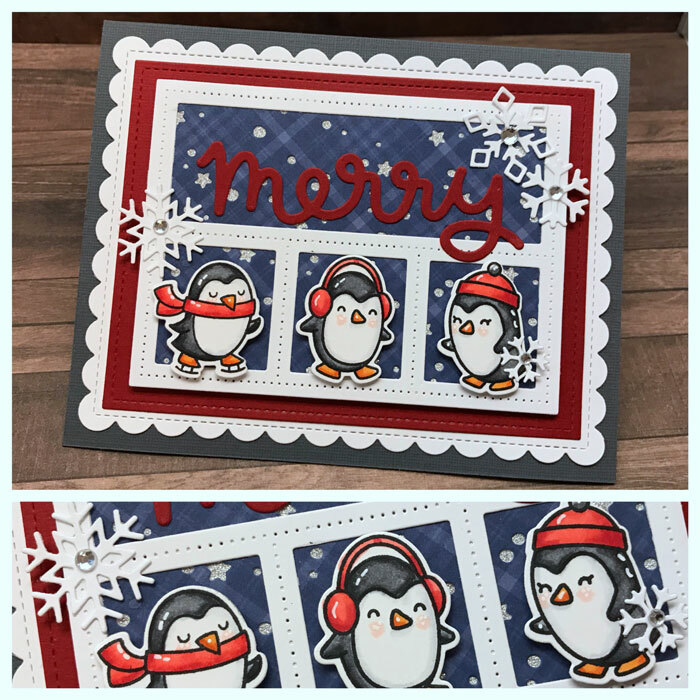 Here I used Penguins from Lawn Fawn Snow Cool set and Winter Penguin set. Colored with my Copics. Dies from Lawn Fawn called Mini Snowflakes, Stitched Rectangle Frame Large, Scalloped Rectangles Frames and Scripty Merry. The patterned paper is called Perfectlyplaid Chill 6x6. These happy and playful gang is from Lawn Fawn Tobogan Together set and Here We Go A Waddling set. Colored with my Copics. I created ther background with Distress Ink pads. The tree border is called Forest Border and the slopes are made with Stitched Hillside Backdrop Landscape. 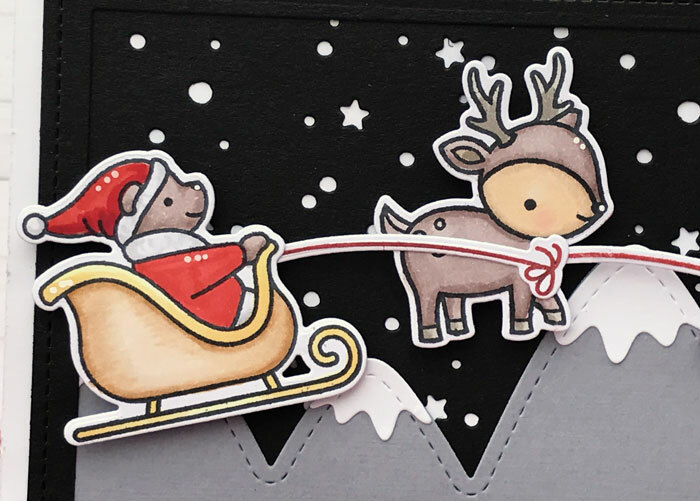 Santa´s sleigh is from Ready Set Snow set. 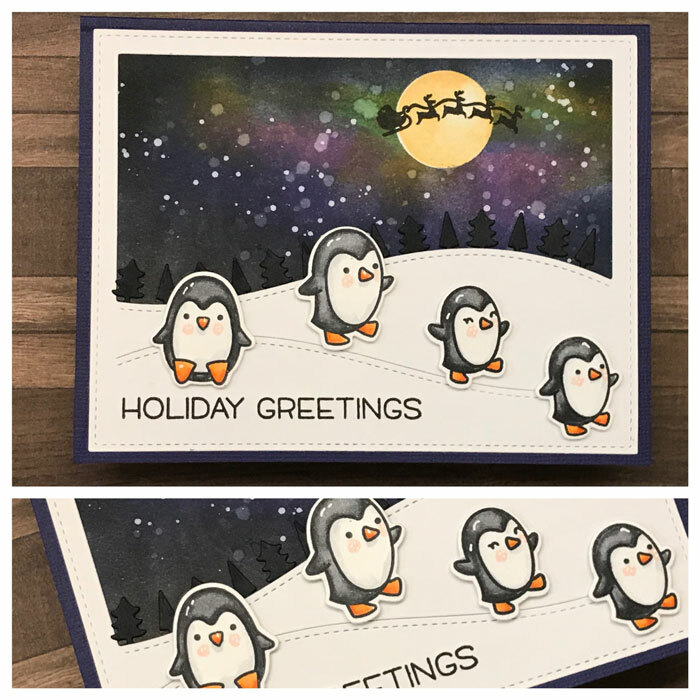 The last card for today is made with the same backdrop die but here are all the Penguins from the Here We Go A Waddling set. Welcome back tomorrow for even more inspiration! Sorry for being missing in action from my blog! If you follow my Instagram you have already seen all my Christmas Cards. But in my blog you also get all supplies and more detail photos. For some days forward I will upload all Christmas cards in my blog. 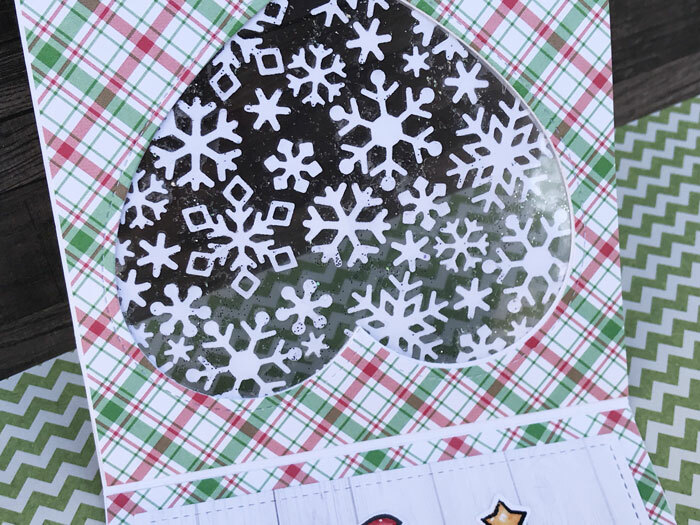 The snowflakes are made with Martha Stewart punches. Rhinestones from You Do. Here I used a stamp from Hänglar & Stänglar 2008. She is colored with my Copics. 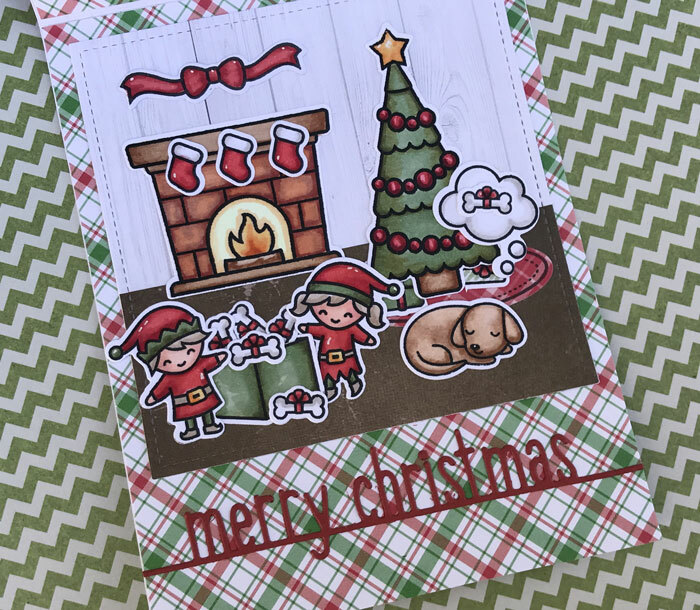 I also used Lawn Fawn Perfectlyplaid Christmas 6x6. 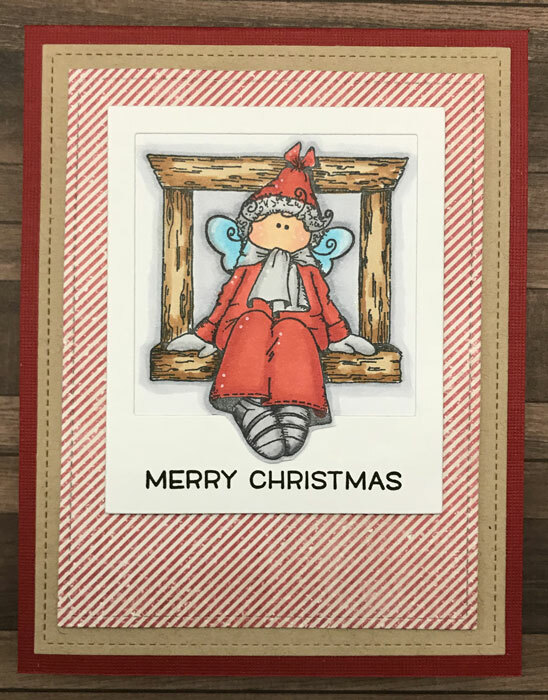 I used a frame die from My Favorite Things called Stitched Scalloped Rectangle. And from Lawn Fawn I used Stitched Rectangle Frame Large and Scalloped Rectangles Frames. This cutie is a stamp from Hänglar & Stänglar 2005. Colored with my Copics. All frame dies from Lawn Fawn. I used Stitched Rectangles Small and Large and also Say Cheese Again. 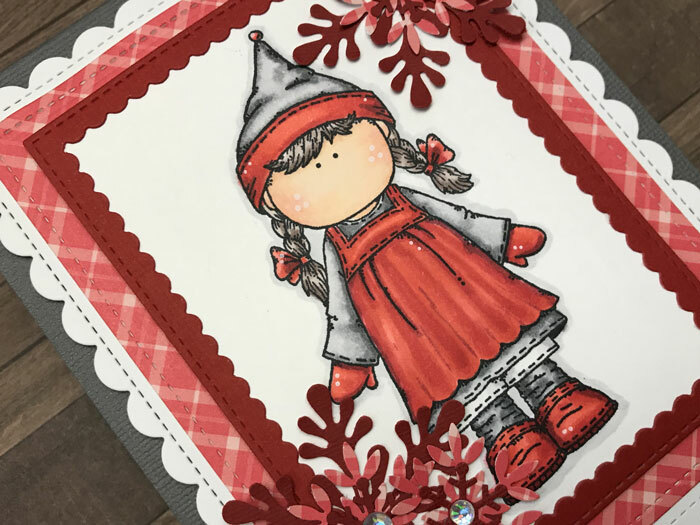 The patterned paper is from Maja Design Christmas Season 6x6. 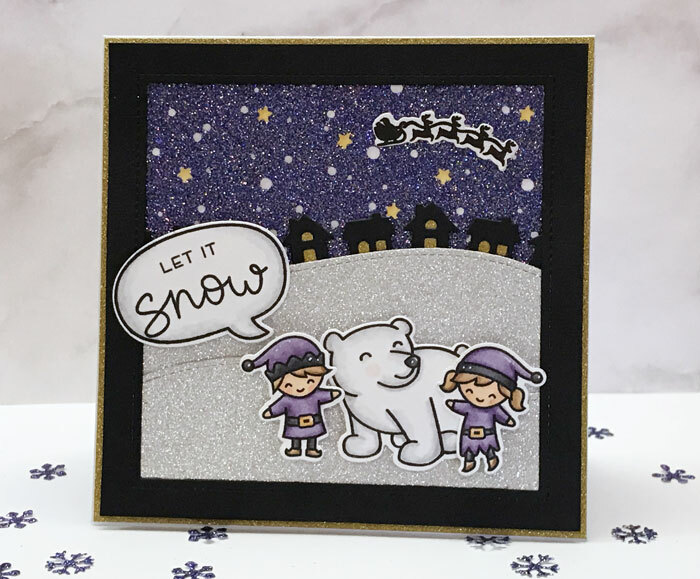 Last in this post is a favorite called Snowy from Penny Black. Colored with my Copics. 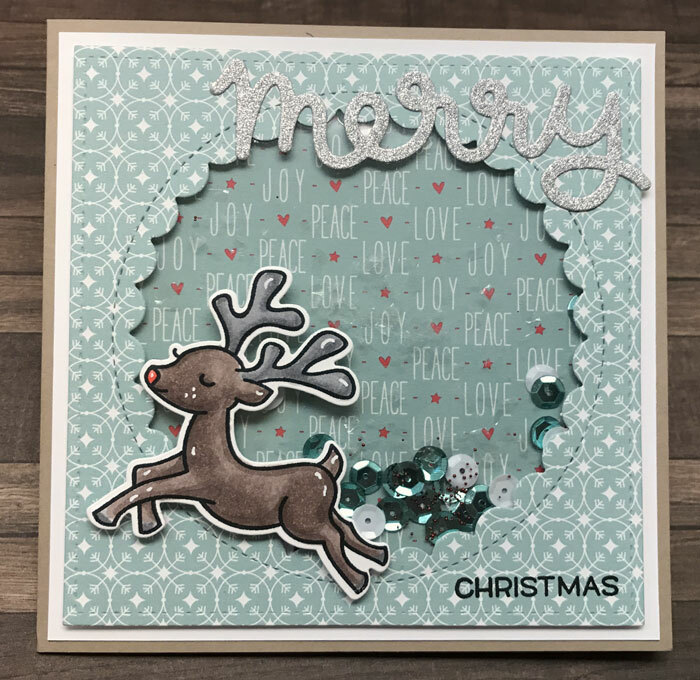 The circle frame is from My Favorite Things Die-Namics and called Merry Christmas Circle Frame. The white frame is created with Lawn Fawn Stitched Rectangles. Patterned papers from Lawn Fawn Peace Joy Love 6x6 paper pad. Welcome back tomorrow for more inspiration! This is my second card created for Lawn Fawnatics Bling It Challenge. This time I went all in with tons of sparkling paper. A dark purple sky and a snow white hill. Even the windows sparkles with gold glitter paper. 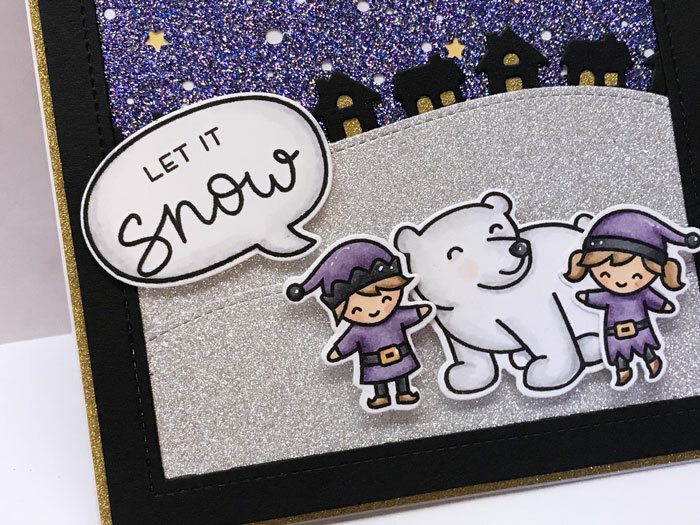 I added black details to get some contrasts and played with the cute Holiday Helpers set and a Polar Bear from Critters in the snow set. 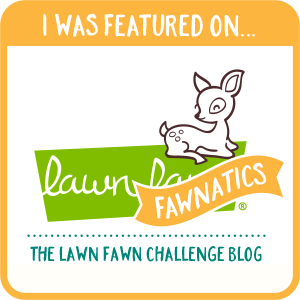 I´m back again with a card created for Lawn Fawnatics challenge 39. This time the theme was Bling it out. 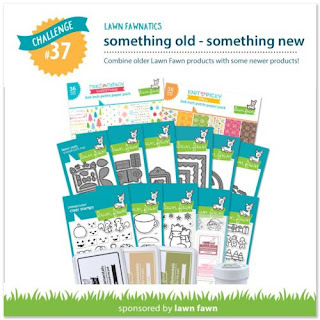 Love that challenge! My card was a bit difficult to take photos of so forgive me for all different photos. You lift up the white speech bubble to see the scene. I created a window with two sheets of OH paper and added the snowflakes and glitter between the two sheets. I used the same patterned paper all over the inside of the card. Here is the cute scene I created. I just love it! So darn cute! The little puppie dreaming of a bone for Christmas and Santas little helpers bringing him a whole box full of bones. I think this is my largest Christmas Card ever! It´s 15x22,5 cm. 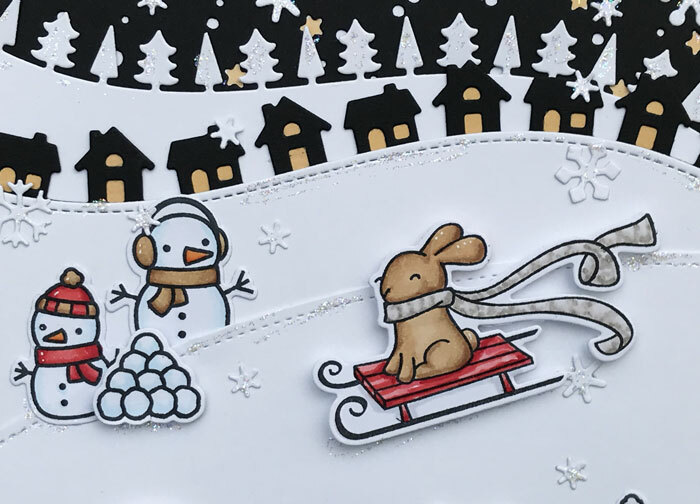 I wanted to create a fun scene with snowy slopes and critters having fun in the snow. I build it without any size plan and this is what I ended up with. I think it´s kind of cute! My adorable Winter Fairies sprinkles snow over the slopes and critters. The Ready, set, snow banner comes from the Ready, set, snow set. To get some texture on the slopes I die-cutted some Mini Snowflakes and added them randomly. I also added some Stickles Fairy Dust. Today I have another Christmas card to show you. Over att Lawn Fawnatics the challenge was to combine something old with something new. A really fun challenge! I thought the Reindeers from Toboggan Together worked really well with the new set called Oh What Fun. 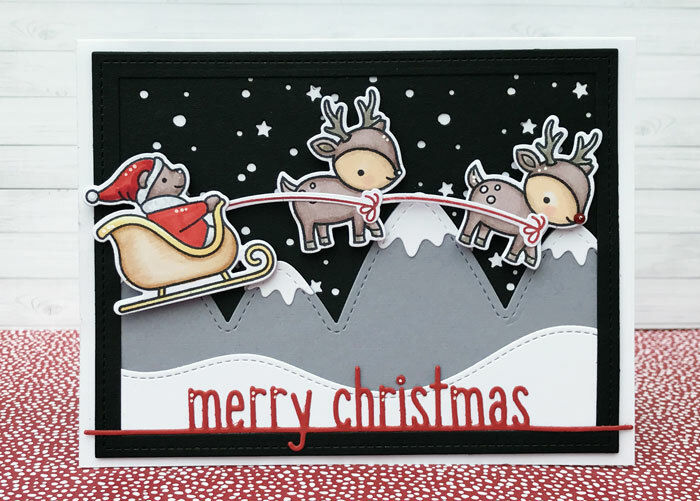 On one of the Reindeers I added a red half pearl and named him Rudolph :) I love to add some black to my work and here I think the red really pop with the more neutrals colors. 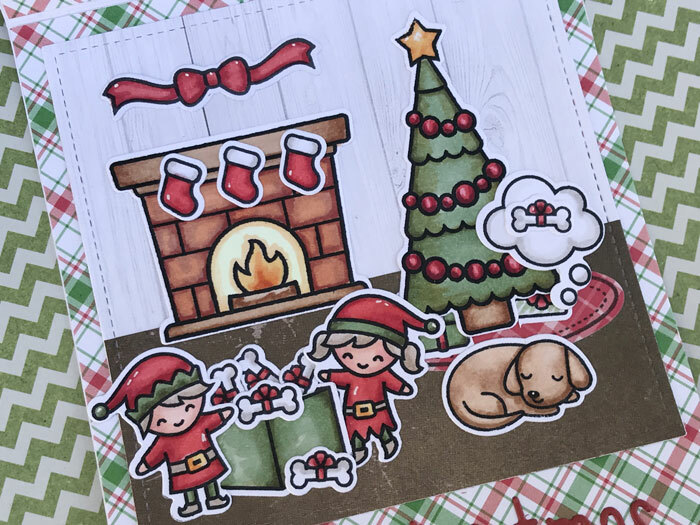 I have lots of ideas so I will create more cards for this fun challenge!